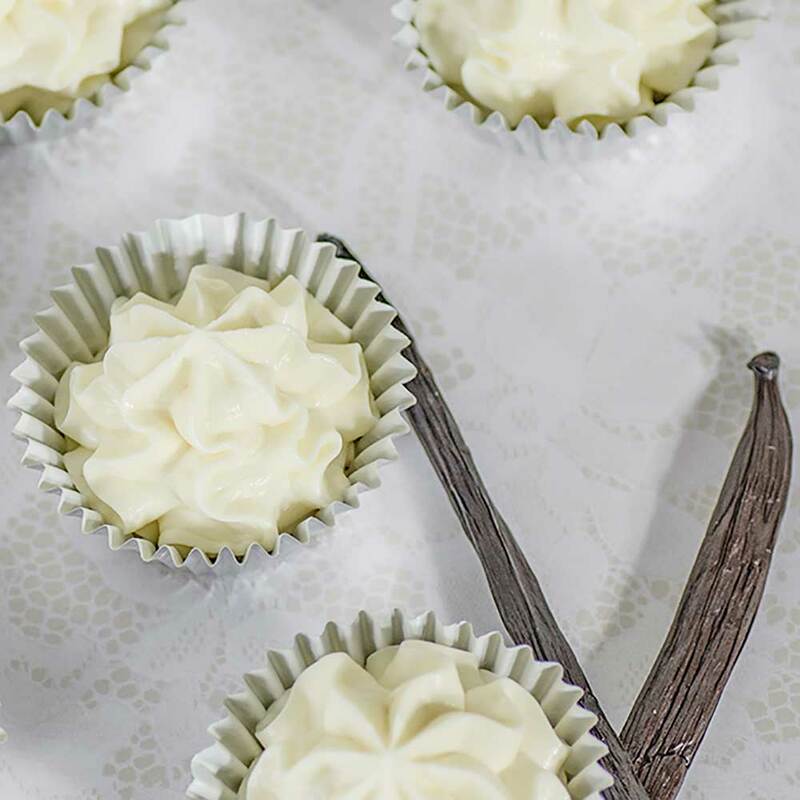 Vanilla Cheesecake Fat Bombs - "The #1 ORIGINAL Low-Carb Recipe" - Melt in Your Mouth! 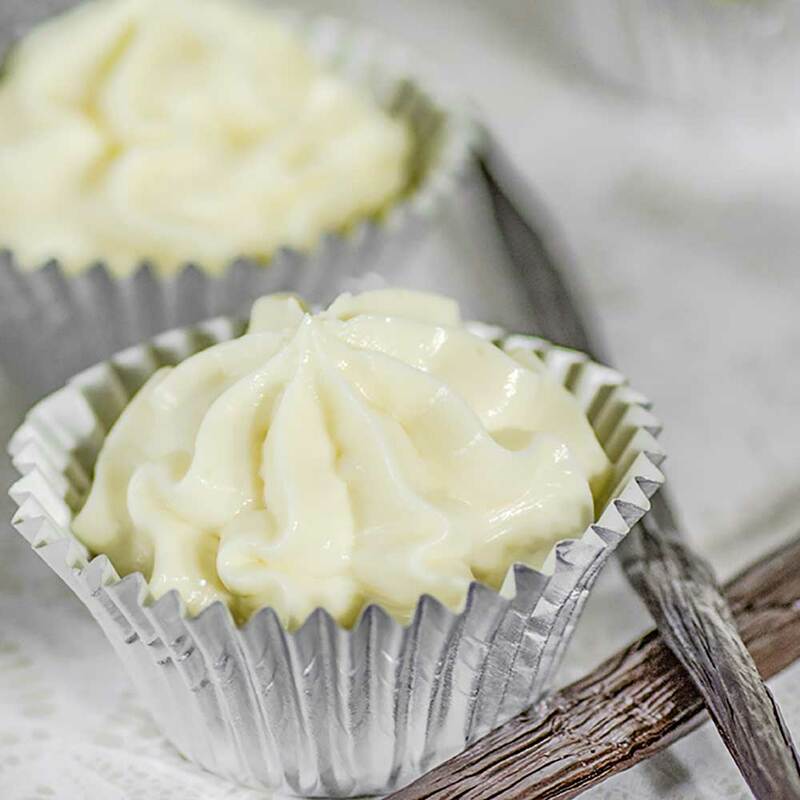 Our Vanilla Cheesecake Fat Bombs recipe is famous and 100% Ketogenic. Back in the day when Gerri first created this recipe she was using just what she had in the fridge, some cream cheese, sweetener sachets, heavy cream and some vanilla borrowed from next door. They were delicious. The vanilla cheesecake fat bombs were born. From there she refined the recipe to include a better sweetener and cooking processes. And that’s how she came up with the idea of these very popular vanilla cheesecake fat bombs. When purchasing the ingredients for your vanilla cheesecake fat bombs ensure the cream cheese is the whole version and not the low-fat version to keep them keto. Note: As we are cooking all the time we use a food mixer like this one because they free up our hands and do a great job. If you are cooking or planning to cook all the time we recommend you investing in one especially if you batch cook. If not and you only cook every now and then, a good hand mixer like this one will serve you well. Put the cream cheese, vanilla and erythritol into your kitchen aid and mix on low. Alternatively put into a bowl and mix with a hand mixer on low speed for 2 minutes, pausing to scrape down the sides of the bowl with a spatula, so as to achieve a smooth consistent texture. Add half of the heavy cream and mix for another 2 minutes. Let the bowl sit for 3-5 minutes as erythritol in its granulated form requires a little extra time to dissolve. Gently spoon the mixture into a piping bag like this one and pipe into mini cupcake liners. Set the Vanilla Cheesecake Fat Bombs in the fridge for at least 1 hour before enjoying. If you enjoyed making these cheesecake fat bombs try our Chocolate Cheesecake version for some variety or our Sugar-Free Jello Cheesecake. These Delicious Vanilla Cheesecake Fat Bombs are high on taste and will give you a long-lasting boost of energy. They're deliciously creamy and taste just like a cheesecake! Put the cream cheese, vanilla and erythritol in a kitchen aid or put in a bowl and mix with a hand mixer on low speed for 2 minutes, pausing to scrape down the sides of the bowl with a spatula, so as to achieve a smooth consistent texture. Gently spoon the mixture into a piping bag and pipe into mini cupcake liners. Set in the fridge for at least 1 hour before enjoying. How Many Carbs in Cream Cheese? There are 4.1 grams of carbs in cream cheese all of which are net carbs. However, per cream cheese fat bomb there is a mere 1g net carb along with 9 grams of fat and 1 gram of protein. When purchasing cream cheese for your vanilla cheesecake fat bombs be sure it is the full-fat version. These bite-sized keto cheesecake fat bombs are loaded with flavor and provide a nutritious hit of healthy fats courtesy of their cream cheese and heavy cream content. They’re a fantastic very easy to make low-carb keto snack to have on hand when entertaining. Our low carb vanilla cheesecake fat bombs will keep well in the refrigerator serve them with tea or coffee or keep them as a quick, go to, energy boost while in keto. The recipe makes 18 mini cups. One Vanilla Cheesecake Fat Bomb is one serve. 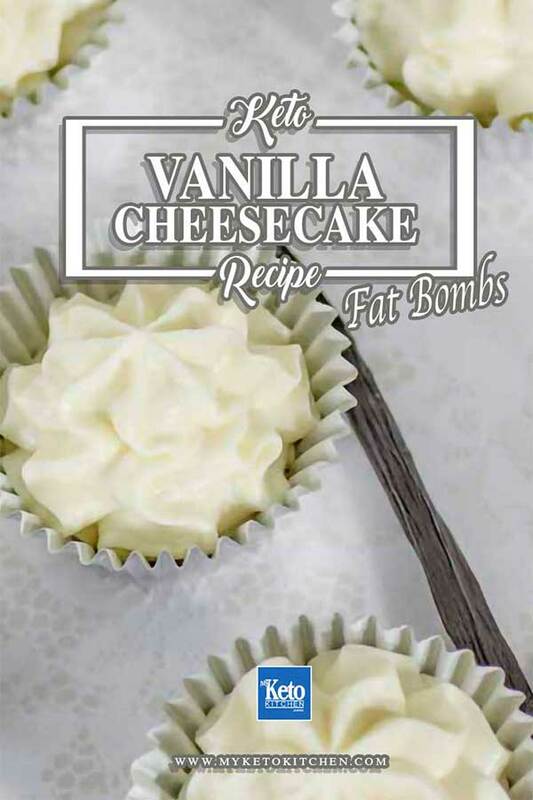 You can adjust the serving amounts for your Low-Carb Vanilla Cheesecake Fat Bombs in the recipe card above. Thanks! I thought it was just me. Hi Sanela, The recipe makes 18 Vanilla Cheesecake Fat Bombs and a serving is one fat bomb. It’s hard to stop after one. These are great. I also use lemon extract to make them, like those even more! Thanks Pam. We’re so glad that you love them 🙂 Using Lemon Extract is a great idea too! Can you freeze these? I just made a batch…..they are delicious….reminds me of cream cheese frosting. Hi Treena, They should be the same texture as a not-baked cheesecake without a crust. Give them a bit longer in the fridge to set and they should firm up, it may just be that your fridge is slightly warmer. Fridges can range between 0C-5C/32F-41F. I hope this helps. One fat bomb is one serving. I just finished making these and a put a raspberry in the center of each one. I thought that would taste better than lemon or lime to me. Also no worries about making it too thin. Planning to make these this weekend!! Can I add cinnamon to it? Adding cinnamon sounds like a great idea. I think 1/4-1/2 a teaspoon will be a good amount. Granulated xylitol can be substituted with the same ratio. We haven’t heard of anyone making them without sweetener. You can definitely try it for yourself. It won’t make much of a difference to the texture, but there will be zero sweetness. I hope this helps. The gram of sugar in the nutritional information is from the Lactose that is in all dairy products. You certainly can! Beware they become very, very hard when frozen, leave them to defrost before enjoying or you might break a tooth. Nutrition facts displays carbs for 1 fat bomb? These are wonderful! I added a pinch of salt, the zest of a small lemon, beans from one vanilla pod and a couple sprinkles of powdered stevia to offset the lemon. So satisfying with a few fresh raspberries! I’ve been making these for quite a while, and I use essential oils to add different flavors. (Make sure your essential oils are 100% pure therapy grade, and safe for consumption) I use lemon, peppermint, and even ginger and cinnamon to make a variety of treats for different times of the year. Just 2 or 3 drops flavor the whole batch, with no added sugar! So these are really good but what makes them fatbombs? I thought fatbombs had some type of butter or coconut oil in them? Fat bombs are small snacks with a high-fat content. These fat bombs use cream cheese and heavy cream which are loaded with fat. When I convert the ingredients to US AND UPLOAD INTO MYFITNESSPAL the fat is only .8 and carbs are 2.9 . Why the difference? The difference will lie in the products that My Fitness Pal is using to calculate. We calculate the nutritional information from the products that we use to create the recipe – depending on where you are in the world and your ingredients, you may get slight differences in the nutrition. 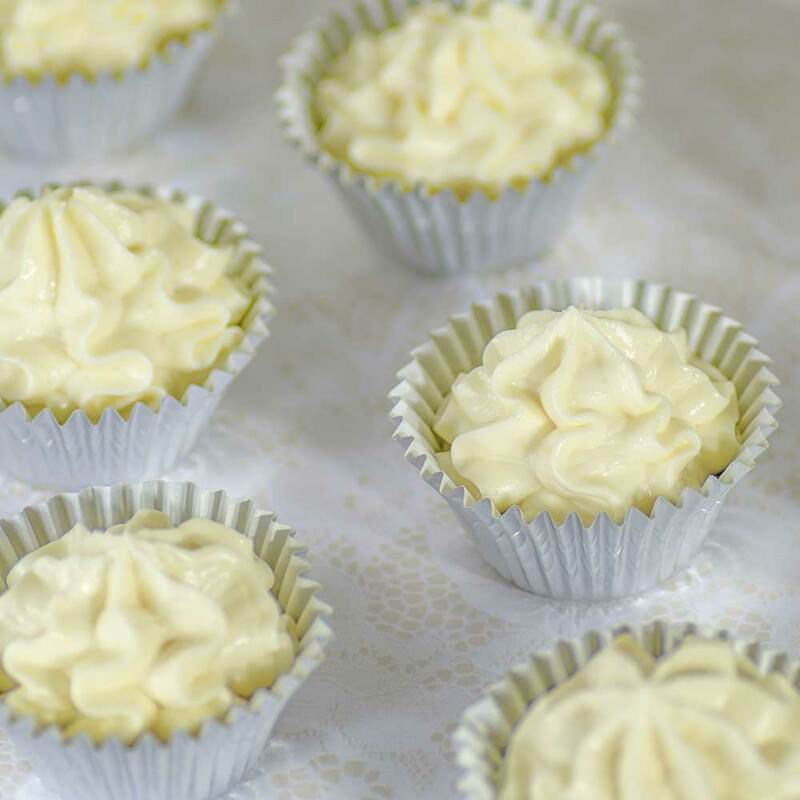 For the love of cheesecake these lemon bombs are amazing! I cut way down on the Stevia and added fresh lemon and lemon thyme sprigs from my garden to dress them up and help them zing a bit more for my liking. It’s a good easy base to use any flavouring you like to change things up a bit. Great share. These are delicious!!! Thank you. Can you add Lilly’s chocolate chips to this before freezing? Can I use Stevia instead of the other sweetener? You sure can. If you are using a liquid sweetener the fat bombs will be much softer. Would these set firm enough to be able to make them in a mould? No, they are quite soft. They will set in a mold if you choose to freeze them though. Just made these for the first time. Added 2 tsp lemon juice and about 2 tsp lemon zest to batter before final mix. Added one blueberry and a little lemon zest on top. Appealing to even those NOT on keto. I need a 4:1 fat to protein + carb ratio, so I can eat 3 or 4 of these every day to boost my fat count. I will add these to my favorites!! I just made these but added 50g of sugar-free strawberry preserves. OMG! They are soooo good! They were awesome before adding the preserves but I just wanted some strawberry flavor. Thank you sooo much for sharing this recipe! My freezer will NEVER be without these yummy a little treats. They are so easy and so good! I’m going to try adding cinnamon as other readers suggested. I made a batch using maple extract and it was just enough to tame my desire for a maple bar from my local bakery. Im thinking maybe some maple cinnamon would be great together. I will definitely be making these again … in fact I think I’ll go do that right now. Thanks for a great recipe. OMG made these today – they are awesome! I used powdered Lakanto so no worries about dissolving the sugar. My only worry is how muck I licked off the spoon and bowl making them!!! Thank you for your kind words Tamara! Glad you like them Terra. They sure can! I recommend letting them defrost slightly before enjoying so you don’t break a tooth! If you click the “metric” button the recipe will convert to grams and mls for you. You can use sucralose, just note if you are using a liquid sweetener that the fat bombs won’t firm up as much. I use 18 “full size” cupcake liners, just spoon the mixture into them and then freeze them. When I take one out, after a minute or two I just pop them out. They are cold to the fingers, and must be eaten carefully (no broken teeth), but are a great substitute for ice cream! That’s a great idea, Barbara. Thanks for sharing! Thanks bunches for this recipe. It really is amazing, simple, easy, delicious and versatile. I decided to experiment (measurements are all approximate) with stuff I had on hand, so made a batch then split into 3 bowls. First bowl, I added zest from 1 lemon, 1/2 tsp lemonade powder, and topped some with a blueberry. Next bowl, I added about a Tbsp Jello Sugar Free White chocolate pudding mix (these were the favorites). Third bowl, I added 2 tsp Sugar Free raspberry jello mix. I also found that the additions helped firm up the bombs so I was able to use a small cookie dough scooper to place them on platter. If you want to add a crust-like taste/mouth feel, add a nut or two to each bomb. I used salted nuts…pecans, cashews, walnuts, but my fav were the macadamias (ooh so buttery). Even my anti-keto 18 year old son was all over these and asking for more! Thanks again! OH EM GEEEE!!! I just finished making these cheesecake fat bombs and I licked the spoon before I finished everything…..WOW!!!! I’ve been craving sugar for 2 weeks and this hit the spot. The taste is mindblowing and delicious! Thank you so much. I’m telling everyone about this. I’m beyond pleased with my first attempt at this. I’m checking out everything you do!! Love these and make them often!! I like to put fresh fruit on top! There is a reason why this is almost a 5 star treat with as many reviews as it has. This is the first review I have ever written on Pinterest. 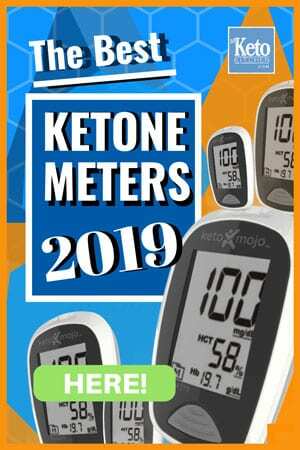 I’m writing it because I have been eating Keto for about 4 weeks. I’m sick of making “fat bombs” to only be let down by the terrible taste. If you like cream cheese frosting, you will like this. I will occasionally throw a fresh strawberry on each fat bomb for a little flare. Thank you, Ben! You have made my week!